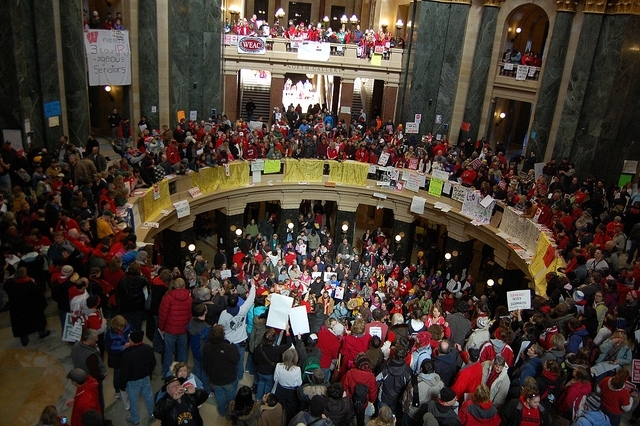 The budget battles in Wisconsin, Indiana, and across the Midwestern United States have inspired a barrage of commentary about what the successful passage of the proposed state laws to strip public sector unions of their collective bargaining power would mean for public sector workers (not good), black workers (really not good), and the future of the labor movement (really, really not good). Another group with a significant stake in the outcome of these debates over public sector union bargaining power is women. First, let’s review a few facts about women and labor unions in general. Although unionized women earn more than non-unionized women on average and have access to more benefits, such as paid leave and health insurance, public sector employees are actually paid less than their private sector counterparts, once their qualifications are taken into account. An IWPR report on job retention and low-income mothers found that union membership contributed to keeping moms on the job. In 2010, across race and ethnic groups, male union membership is lowest for Asian men, but Asian women have the highest membership rate of all groups of unionized women. Black men have the highest union membership, but black women are also more likely than white women to be unionized. Hispanic women have the lowest rate of union membership compared to other groups of women. Public sector unions like the American Federation of State, County, and Municipal Employees (AFSCME) and the American Federation of Teachers, however, have a majority female membership (52 percent and 60 percent, respectively), which makes the legislative outcome of public sector union bargaining power of particular interest to women workers. 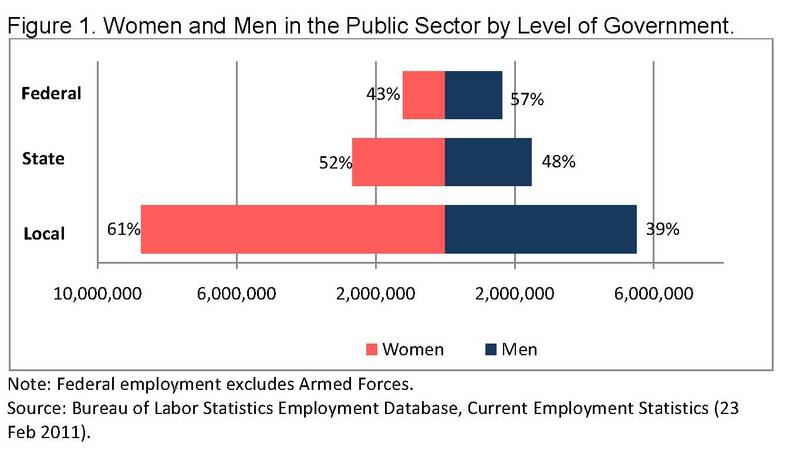 Furthermore, as you can see in the figure at left, women are 52 percent of the state public sector workforce and a whopping 61 percent of public workers at the local level (Figure 1). If we focus on public sector employees at the local level, it becomes clear that women and their families will receive the brunt of the effects of these anti-union bills floating around state capitols in the Midwest. The most common occupation for local public sector women workers is elementary and middle school teachers (22 percent). The most common occupation for local public sector male workers? Police and sheriff’s patrol officers, a group whose union representatives would be excluded from proposed legislation. This isn’t to say that men won’t be impacted by any effort to strip public sector unions of their bargaining rights. At the state level, three of the five most common public sector occupations for men are in teaching fields. Indeed, fire fighters and police unions have come out to protest in support of public sector employees–a blow to public sector union rights is a blow to all union rights. As more women become breadwinners, women’s families will also feel the effects of any proposed legislation that affects women’s wages. In the U.S. workforce, four in ten women work in female-dominated professions. For example, elementary and middle school teachers–the occupation that is most common for local public sector women–are 81 percent female. Moreover, women earn less than men in 104 out of 108 of the occupational categories, including teaching, for which there is enough data to calculate the wage gap. With so many women in the public sector at the state and local level, and with a proposed budget bill that would strip public sector unions—especially those representing female-dominated professions—of their bargaining rights, what is the outlook for women workers in Wisconsin and beyond? Not good. I agree entirely with the point rasied by Costas. Among the two priorities rasied it is the first one that needs the most urgent attention, that of refroming the judiciary. Without an efficiewnt court system all other reforms will become ineffective. The need for growth as a vehicle that would take Greece out of the current crisis is tautological. The debate about whether to remain or not in the euro zone is important, but it will remain academic unless there is a concerted effort (with the help of the EU in this case) to fight corruption. To do that most of the energy and effort has to be spent on reforming the judiciary. The rules of the game are such that whoever “screams the loudest” has better access to the media and the benefit of the judiciary system that is inherently incapable of ensuring a framework on which economic reforms can take place. Without contracts that are enforceable for all the parties involved, it will be futile to introduce reforms. The latter will be unravelled by the inability of the courts to enforce these contracts. For the new reality to become understood as something that requires new bold reforms to open up highly regulated markets and allow for productivity convergence between the public and private sectors, people need to be convinced that the rules of the game apply to all concerned. Until now as we speak, any attempt to bring individuals to justice who have either stolen public funds by not returning huge sums of collected VAT to the government, let alone the known income tax evaders, only results cases that are pushed into the future as these individuals are allowed to walk. The excuse here is that the judiciary is too overburdened to deal with these cases effectively and promptly. I am afraid that unless this government or any government deals with that aspect of the broken system, any reforms will never be implemented. To have any chance of success, let alone any chance to reach a climate for economic growth, there has to be a framework for enforcing contracts that is recognized and respected by all by imposing stiff penalties to all those who violate their side of the contract, whether public officials involved in corruption cases or entrepreneurs not returning the sums of VAT that they have collected on behalf of the government.One may counter, that Greece was growing until 2008 at reasonably healthy rates with the same judiciary and the same lack of contract enforceability system. Yet, even though we all recognize the reasons behind this consumption led growth engineered by easy credit, which led to the current crisis, it is the asymmetry between the upturn and downturn that obscured any need for reform. An expanding economic pie conferred benefits to all, even though these benefits also created “built in” destabilizers that now confront us all. I think, given the state of corruption as the result of lack of contract enforceability, the main reform that at this point that needs to take place, is the reform of the judiciary, for anything else to have any chance of success.